In 2016, I posted an article entitled “LegalHack Series: How to download files from the Malaysian Court Online File Search System” (“LegalHack Case Search No. 1“). With the introduction of the new e-Court system (Phase 2), the said search method is no longer usable. 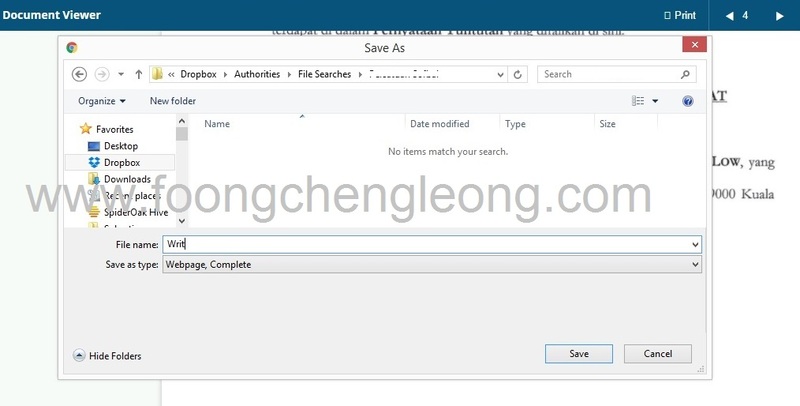 Instead of introducing a new and effective way for users to conduct file search, the new system followed the old method. 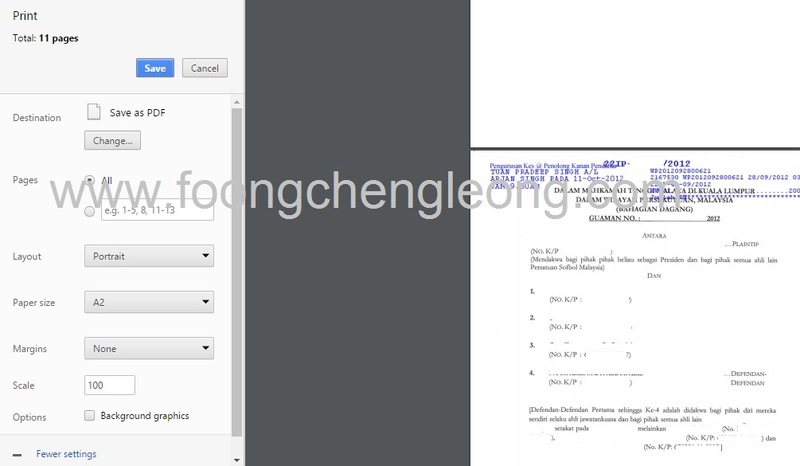 A user is still required to pay a fee (RM8 and RM12 for a file search in the Subordinate Courts and High Court respectively) and the user is only given 30 minutes to do the search. It is baffling why the Court could not roll out a one-off fee to allow users to download every file instead of forcing them to view them online (ie on their browser). User will have to print the page one by one if they want to have a copy on their computer. This is fine if the document does not have many pages. However, there are a few good features introduced on this new system. 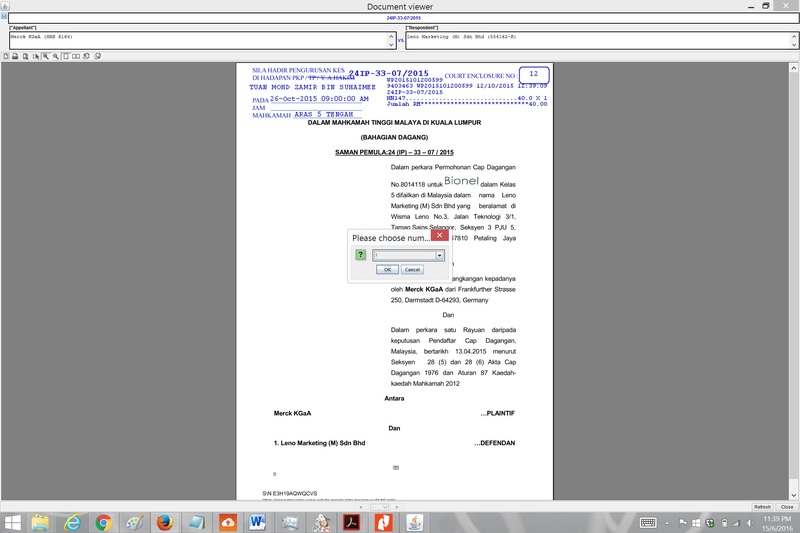 For example, the timer will stop if you are loading a page, and Court issued documents (e.g. letters) can also be viewed. For larger files (20 pages and above), it would be more time efficient to download the entire document rather than printing it one by one. Under the old efiling system, I could download a large amount of files within 30 minutes using the LegalHack Case Search No .1. Nevertheless, it is still possible to download files using Phase 2 but it is slightly more complicated. I found one possible way (which requires no scripting or complicated software) to do so (click images below to enlarge). Step 1: Purchase a Token at https://ecourtservices.kehakiman.gov.my/. Step 2: Go to the File Search Page. Enter the token code and suit number thereafter. 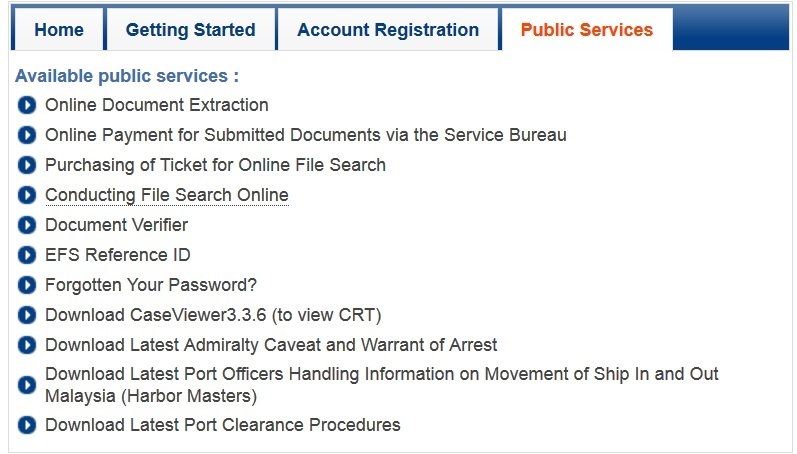 Step 3: At the Case Information page, click on Document Listing. Step 4: Choose the file you want and open it. Instead of loading the page one by one and allowing the timer to run, obtain the Serial Number (S/N) of the file at the bottom of each page. 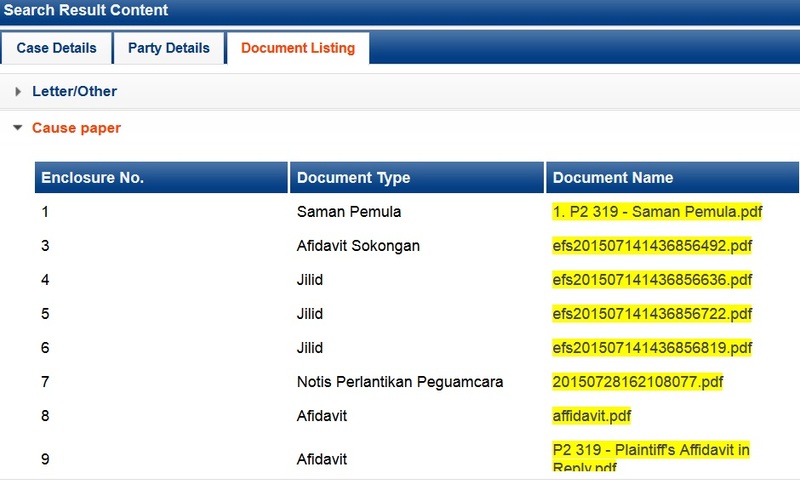 Step 5: Once you obtain the Serial Number, go to the “Pengesahan Dokumen” page at the eCourt website. Enter the Serial Number and click on “Sahkan”. If the Serial Number is correct, you will be able to view the file without a running timer. Step 6: Each page of the file will load when you scroll to that page. You will need to ensure that every page is full loaded before you do the next step otherwise you will have an empty page. Step 7: Once all the pages are loaded, right click on the page and click on “Save As”. Save the entire page into a folder of your choice. Step 8: Then go to the folder “Pengesahan Dokumen_files” and find the file “Viewer.html”. Copy and paste the file “Viewer.html” to another folder. Step 9: Open the Viewer.html file using your Chrome browser. The file you open now will only show some buttons on the top left side and the content of the file in PNG format. Step 10: Instead of downloading the PNG files one by one and merging them into a single file, you can save them all into one PDF file by printing the page into PDF (Ctrl + P). Choose “Save as PDF” or any PDF maker of your choice (e.g PDF24 or doPDF). Under More Settings, choose Paper Size A1 and Margins: Default. By saving it in this manner, you will have a nicely formatted PDF file. If the file is not properly formatted, you can change the Paper Size and Margins to get the right fit. 1. Save all the files you need before converting them to PDF. 2. You may need a slightly powerful computer to convert the files into PDF as some files that you download may be very large. I had a 2 Gigabyte file from a 400 page affidavit. However, you can breakdown the conversion of the files by setting the system to print 50 or less pages per print. 1. The eCourt system timer may reset to 0 while doing a file search. You will have to email the eCourt Helpdesk for assistance otherwise you will should purchase another token. 2. If there are two or more cases which have the same suit number (e.g. in Kuala Lumpur and Selangor Court), you will be automatically directed to one case and you have no option to choose another case. One of the weaknesses of our Court’s efiling system is the online file search system. 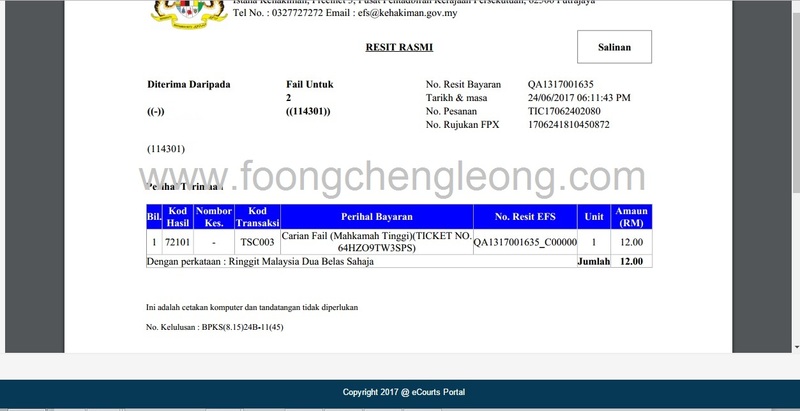 A user has to pay RM12 (for High Court and above) or RM6 (for Subordinate Courts) to be able to do an online file search for a maximum period of 30 minutes. The time runs upon opening a file on the website (at main page, under Public Services menu). However, one cannot download a file from the website but one can only view it. The viewing function allows one to view one page at a time and also print one page at a time. Each page takes some time to load and 30 minutes is not sufficient. This is baffling. Why can’t they put a function to allow users to download the entire file? This is what you get when you roll out a system without proper consultation with the end users. 1. Download the free software PDF24 and install it on your PC. 2. Open the file you intend to download on the Online File Search System (login to the system first). 3. 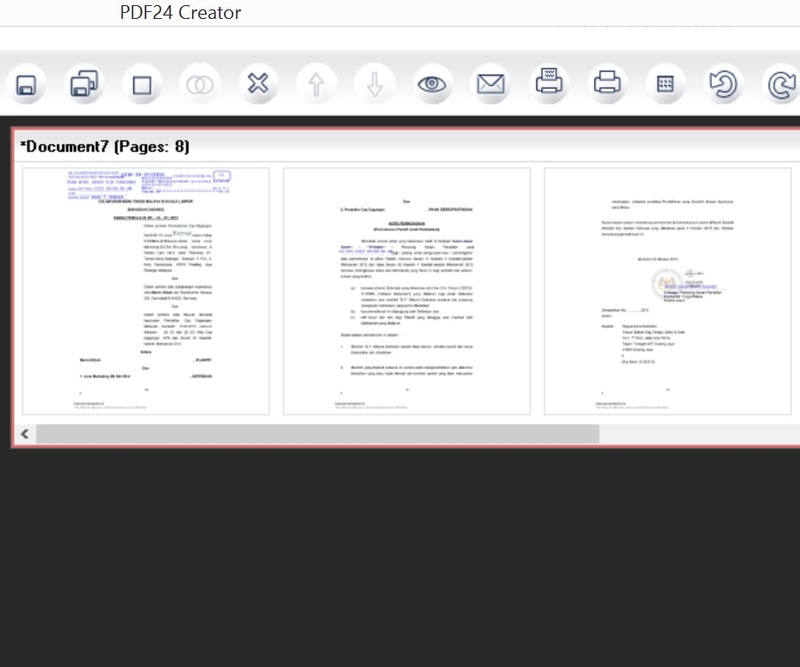 Choose PDF24 as the printer. 4. 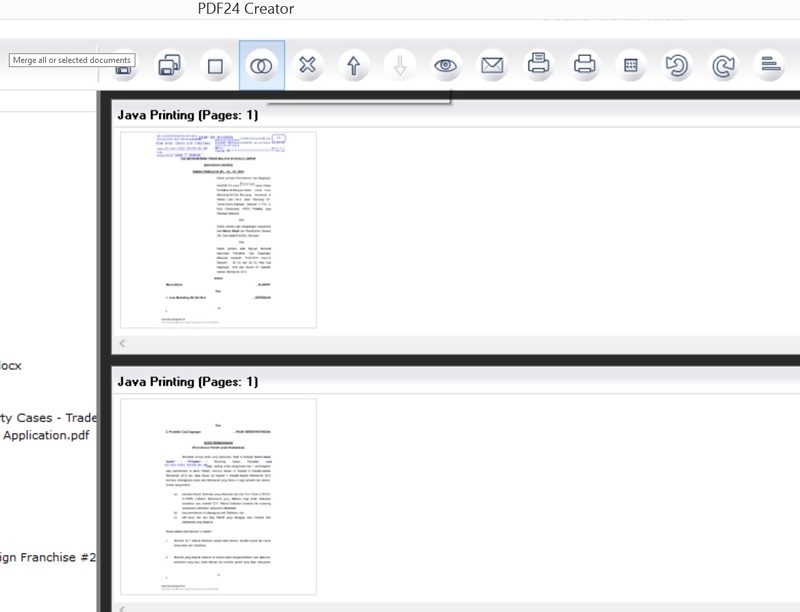 Every page will be printed as a separate file on PDF24. To merge them, click on the Merge button on top. All the pages will be merged into one file! 6. Repeat step 2 to 5 above for other files. * Tip – Close the file on the search system to stop the timer. Foong Cheng Leong, who runs a law firm on his own as a sole proprietor, said he used to have a virtual office, where the service provider would provide a receptionist at an office space to take phone calls that would be conveyed to him through SMS, to receive and forward mail to him, and also provide a meeting room for use. Such services and the office premises can be used by other businesses at the same time too. The virtual office located here only cost him RM1,200 a year, compared to renting an office in Publika, near the Kuala Lumpur courthouse, that currently costs RM4 per sq ft that could amount to RM3,200 a month for a 753 sq ft unit. “Confidentiality is a valid reason, but I don’t see any problem with it. In the virtual office, the receptionist doesn’t open letters,” Foong told Malay Mail Online in an interview. The intellectual property and information technology lawyer said big firms do not like virtual offices as small firms using such offices would be able to charge much lower legal fees, compared to large practices that need to cover huge overhead costs like rental and staff salaries. According to the Bar Council, mid-sized firms in Malaysia have about 30 to 40 lawyers, while big firms have close to 100. Foong, who works from home and stores clients’ documents there, said his house is more secure than offices, pointing out too that most files are now electronic and transactions are done online. “IT security is more important than physical security,” he said, adding that he generally meets clients at their office. The Bar Council issued a circular in March 2014 banning lawyers from using virtual offices. A group of lawyers then met with the Bar Council’s legal practice committee to discuss the ban. However, the Bar Council later issued a letter dated August 21 this year to the group, saying it would maintain the ban on virtual offices. In the letter sighted by Malay Mail Online, the Bar Council cited issues of solicitor-client privilege, the keeping and storing of physical documents, and the accessibility and traceability of lawyers being compromised through virtual offices. Recently, bar regulators around the world have been forced to reconcile outdated rules regarding attorney office space with the realities of modern day law practice. Several jurisdictions have come under fire from attorneys, forcing changes in the law. Two notable and highly-public examples include the relaxation of the “bona fide” office requirement in New Jersey permitting the use of virtual offices, and the very public federal court battle about New York Judiciary Law §470 and its office requirements for non-residents. It is no denial that confidentiality is an issue. But as pointed out by Stephen Furnari, the service providers are bound by duty of confidentiality. Receptionists at the virtual offices do not open mails of their clients. I’ve also never wrongly received any letters belonging to another. Every innovation comes with a risk. Lawyers are storing documents in the cloud but such practice bring immense convenience to them and their clients. It is now a question of benefits against risk. I am pleased to announce that I have been re-elected as a committee member of the Kuala Lumpur Bar Committee for the year 2016 / 2017. I have also been re-appointed to chair the Kuala Lumpur Information Technology Committee. This Committee will continue its development of the Kuala Lumpur Bar website, App and membership management system. Having considered the reasons and proposals put forth by the group of lawyers during its meetings with the Legal Profession Committee, as well as the Memorandum prepared by one of your members, the Bar Council is of the view that crucial issues such as the cardinal principle of solicitor-client privilege, keeping and storing of physical documents, accessibility and traceability of lawyers are being compromised through the practise of such mode of offices. In light of the above decision, you are required to take immediate and necessary steps to ensure compliance with the relevant Rules and Rulings of the Bar Council, the Legal Profession (Practice & Etiquette) Rules 1978 and the Legal Profession (Publicity) Rules 2001 and cease to operate through virtual office with immediate effect. The concept of a virtual office essentially means there is no physical presence of a law office. The office is “virtual” as it is merely a front, consisting of generic office facilities operated by another company offering the services of a receptionist and/or interchangeable meetings rooms, used by various parties (whether lawyers or not) paying for such services. Any telephone calls made to a lawyer utilising this arrangement are received by the receptionist, on the lawyer’s behalf, who would then convey the communication to the lawyer concerned, for example in a text message through a short message service (“SMS”). Documents are also received, on behalf of the lawyer, by the receptionist. The services of the receptionist and/or use of meeting rooms at a virtual office are shared by other lawyers and/or companies and/or businesses. The Bar Council is of the view that lawyers practising through virtual offices are in breach of Ruling 7.03 of the Rules and Rulings of the Bar Council Malaysia, which provides as follows: Where an Advocate and Solicitor shares an office or premises with another person (whether an Advocate and Solicitor or not), the office or premises must be partitioned off with separate and distinct entrances, with no connecting door between the two offices or premises. This Ruling shall not apply to Advocates and Solicitors who are partners of the same law firm. Where a law firm operates through a virtual office, a further cause for concern arises in respect of confidentiality and the safekeeping of information, including files and documents, which appear to be lax in such virtual offices. Members are therefore advised to cease such operations with immediate effect, as the Bar Council may take disciplinary action against lawyers who are reported to be operating through virtual offices. The Group subsequently got in touch with the Bar Council and meetings were held with the members of the Legal Practice Committee (LPC) to clarify and discuss on the ban. A moratorium was granted pending the discussion between the Group and the LPC. This moratorium was subsequently lifted with the letter of 21 August 2015. Notwithstanding the said ban, it is unclear what type of virtual office is banned by the Bar Council. There are many service providers in Malaysia who term their service as a virtual office service but they differ from each other. The features of a virtual law office and methods of communicating and delivering the legal services online differ depending on the features available in the technology chosen to set up the virtual law office. These features will continue to evolve with the technology, but the key feature that will remain the same is the client portal, which requires a unique username and password. Once inside the secure virtual law office, the client may then have access to his or her case file, documents, invoices, text communication with the attorney, interactive calendar, and forms. In addition, the client may also have the ability to pay invoices online, sign online engagement letters, or hold video conferences or real time chat. Whether the Bar Council’s definition would fall within the scope of a VLO defined above is unclear. Nevertheless, Circular 49 stated that “the concept of a virtual office essentially means there is no physical presence of a law office” and the lawyer is sharing office with third parties. But it is clear that those who have their law office at home with certain administrative functions outsourced would not be caught by the ban. With the advent of broadband, cloud services and other new technological features, a traditional law practice has changed. Working files are no longer kept in our paper files but stored in our PC or even in the cloud. Lawyers do not need a physical file to work but with only a device which may or may not belong to him since one can access them using cloud services. Technology has evolved so much and so quick that a laptop can even now become a tablet and vice versa (e.g. Windows Surface 3). In two years, a smart phone can become your only computer (according to an article by Wired). Traditional physical offices may one day be redundant to some lawyers and could even be reduced to an electronic device. The Bar Council will certainly need to address and be open to these technological advancements. Malaysian lawyers should be encouraged to move ahead with times and adopt new technological advancements to be competitive and on par with any international lawyers. First published on LoyarBurok on 2 November 2015. I presented a seminar on business development for young lawyers. It was attended by 30 lawyers, chambering students and law students. I spoke about the concept of generating and converting leads, tips on having a successful networking conference, building your own database and online marketing. After my talk, we had a group discussion by the participants which were broken down in group. The participants are required to discuss on how they are going to market their legal practice to clients and prospective clients. Each group came out with standard marketing methods and also very unique ideas. One suggested that instead of a legal conference to speak about law, they have a funfair for their clients with their family, and one suggested that they should have a YouTube video on what to expect in a medical negligence case with a scene where a family member actually died. The inaugural meeting will be held on Monday, 16 March, 2015 at 6:00 pm at the KL Bar Meeting Room, 4th Floor, Wisma Hangsam, No.1 Jalan Hang Lekir, 50000 Kuala Lumpur. The KLBC ITC is calling for volunteers who are keen to serve and promote the interests of your fellow members in the legal profession. If you are keen to serve, please email melissadass@klbar.org.my (latest by 12 March 2015). Please state your name and place of practice/pupillage as well as email address/contact numbers for easy reference. I am pleased to announce that I have been re-elected as a committee member of the Kuala Lumpur Bar Committee for the year 2015 / 2016. I have also been appointed to chair the Kuala Lumpur Information Technology Committee. The Publication Committee is now a separate independent committee headed by Siti Munirah Maarof. My presentation slides for the above seminar can be downloaded here. My latest article was published by CLJ under the citation  1 LNS(A) xvii. Last year, I published an article titled “How to use CLJ as your English – Malay dictionary”. As explained by the title, it was a short guide on how to use CLJ”s website, www.cljlaw.com, to translate English words especially your legal jargon into the Malay language. The article was published by CLJ under the citation  1 LNS xxxi. However, CLJ recently upgraded its website thus the need for this new article on how to use the New CLJLaw as your English – Malay dictionary. Unlike the previous system, it is now easier to do the search. Go to the Search Page. Make sure that “Caselaw” is selected as the “Search Criteria” (caselaw is selected by default). In the textbox “Search Term”, insert the word or words you wish to search followed with a space (for “and”) and thereafter, the word “translation”. Note that the word “translation” is the key to enable the dictionary. For example, if you wish to search for the words “liberty to file afresh”, you can put the words “Liberty to file afresh” translation. If you want to search the exact words, you will need to put a quotation mark in the beginning of the sentence and at the end of the sentence. Under “Search In”, click on “Head Notes”. This means that the search will only be conducted on the headnotes of all cases. After that, click on the Search button. Once you get the results, click on any of the cases (if any). The results are located in the Headnote section. You’ll find the searched words highlighted. In this case, “liberty to file afresh” is highlighted in paragraph (4). Now scroll down to the translated section of the Headnote in particular paragraph (4) of the Malay version. The Malay translation can be seen in paragraph (4). I’ve highlighted the section for easy reference.